Our first game of the evening saw Pascoe Vale face Carlton i what is always a close encounter. It was Pascoe who drew first blood with Abbey Flight converting her free kick to open the scoring, though Carlton would battle back as Rebecca Davies finished after the initial attempt was saved to restore parody. Davies then cut inside on her left foot before finding the bottom corner which gave Carlton a slender 2-1 lead at the half time break. Early in the second half Pascoe would pull themselves level again as a long range strike from Anita Odd found its way in, before youngster Pyper Cohen finished a rocket into the top corner to again give Carlton the lead. Late on an open volley for Bruna Silva found the net and levelled proceedings as the game went to penalties. In the shootout Katie Foster missed the first one for Carlton putting them on the back foot as Pascoe converted all three attempts to take home another vital win. Next up saw a rejuvenated Northcote face Champions Fitzroy who were coming off the back of two straight losses. A tight first half saw Fitzroy have majority of the chances with Northcote having a few chances of their own, though neither could break through as we went into the half time break locked at zero. The second half began in the same vein as Fitzroy were peppering the Northcote goal and finally got a reward for their pressure as Sarah Richardson finished at the back post to open the scoring and giving Fitzroy a deserved lead. From there Northcote turned the tide of the game and began to pressure the Fitzroy goal and they managed to pull a goal back through a long range effort from Daniella Galluccio to level the scores. 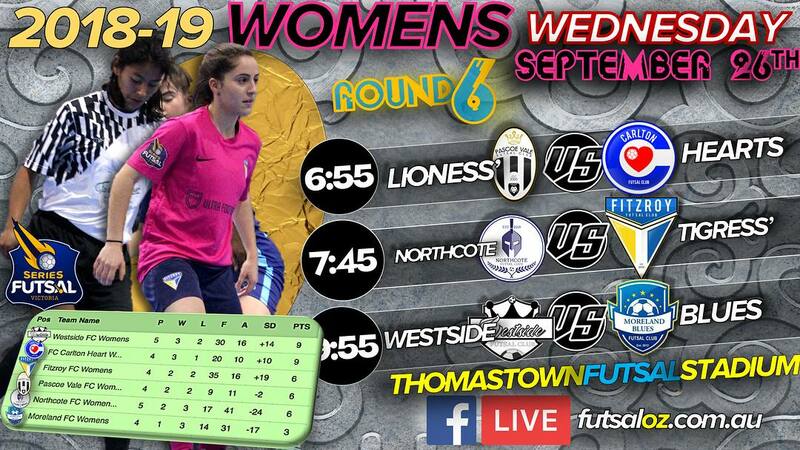 A turnover from Fitzroy shortly after gave Northcote a two on one on the keeper and Camilla Fresneda made no mistake with the tap in as she put Northcote in front, a lead they managed to hold onto to claim their third straight win and hand Fitzroy their third straight defeat. Our final game of the evening saw Westside take on Moreland as both were desperate for the three points. Westside got the upper hand in the first half getting out to a 3-1 lead at half time with Penny Bakopoulos, Pam Demitriou & Emma Fonua all netting while Emma Hubbard kept Moreland in the contest. Westside got another goal early through Bakopoulos for a 4-1 lead but Jacinta Da Cruz split the wall from a free kick to keep Moreland within touching distance. From there Westside added another three goals from Padiki Dade, Monica & Lisa Fonua to all but kill off the game leading 7-2. Late goals from Nikolina Bucolo & Hubbard added some respectability to the scoreboard but it was no more than a consolation as Westside took home another big three points.